Boost the switching capacity and network security of your business with the Business LGS308MP PoE+ Smart 8-Port Gigabit Network Switch from Linksys. Boasting a total switching capacity of 16 Gb/s and a 11.9 Mpps forwarding rate, the LGS308MP comes equipped with 8 RJ45 Gigabit Ethernet PoE+ ports. The switch's support for PoE+ is ideal for powering PoE+-enabled devices such as access points, security cameras, and door security systems without the need for additional power cables. Multiple Spanning Tree Protocol support helps to prevent data loops, while storm control allows for the monitoring and management of traffic levels. IGMP snooping helps to boost network efficiency by directing multicast traffic to only the ports that need it, while MAC-based port security requires clients to authenticate before transferring data. Ideal for complex network environments that demand multiple switches, Linksys Gigabit switches are designed to scale alongside the needs of your growing workforce. They help ensure smooth and seamless network expansion by leveraging IEEE 802.1s Multiple Spanning Tree Protocol, which prevents formation of loops that can be deadly to your network. Multiple high-bandwidth trunks carry data smoothly between the switches, helping alleviate congestion and improve availability. Thanks to storm control, the switches also help minimize loss of service by monitoring and suppressing traffic levels. Equipped with numerous QoS features, the LGS308MP switch intelligently manages traffic to help deliver an optimal user experience. The switch leverages IGMP snooping to limit IP multicast traffic to ports that request it. This allows users to engage in video streaming, VoIP calls, high-volume file uploads, and other bandwidth-intensive tasks while keeping network slowdowns to a minimum. The LGS308MP switch is designed to safeguard your network's mission-critical data from unauthorized access using port authentication and MAC-based port security, which require clients to authenticate themselves before any data is transferred. DHCP snooping filters out traffic from untrusted sources, and IP-MAC binding functions help promote overall network integrity to protect against attacks. IEEE 802.3ad LACP, up to 4 groups with up to 8 ports per group. Port-based and 802.1q tag-based VLANs, management VLAN, guest VLAN support, dynamic VLAN assignment via RADIUS server with 802.1x client authentication. Voice traffic is automatically assigned by OUI to a voice-specific VLAN and treated with appropriate levels. Traffic on multiple ports (up to 4 ports) can be mirrored to another port for analysis with a network analyzer. Embedded remote monitoring (RMON) software agent support for enhanced traffic management, monitoring, and analysis. HTTP, HTTPS, Telnet (menu-driven), DHCP client, system log, configuration unload and backup via HTTP or TFTP, PING, dual images, and SNTP. Supported via web browser (HTTP/HTTPS) and TFTP. 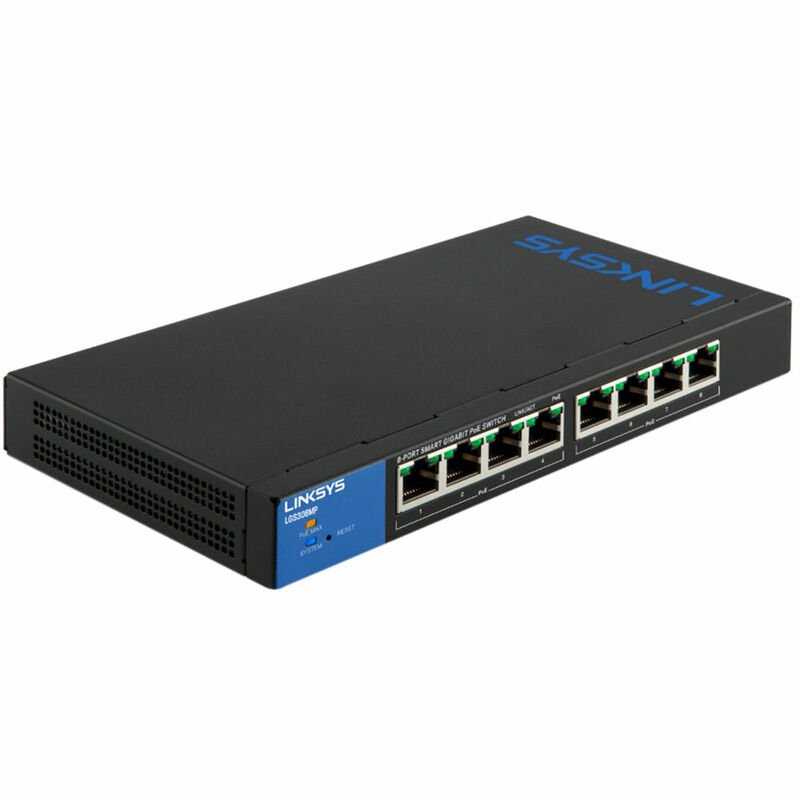 Box Dimensions (LxWxH) 13.5 x 8.9 x 3.4"
Business LGS308MP PoE+ Smart 8-Port Gigabit Network Switch is rated 4.9 out of 5 by 23.